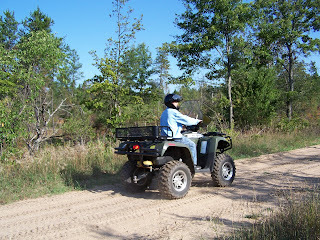 Many of us use ORV's or "4-Wheelers" to get to our favorite fishing lake. If you are planning to use an Off Road Vehicle while fishing in Ontario, it is in your best interest to know the regulations. When riding your ORV in town, the municipality has the authority. And the municipality must have a by law in place to allow ORV riding. Provincial ORV regulations apply to provincial highways only. There are specific provincial highways that cannot travel with your ORV. There are provincial highway speed limits for ORV's. There are parts of highways where ORV's are not allowed like, the median and construction zones. Most Provincial Parks do not allow ORV's. Some do. Know the rules for the area you are traveling. Helmet, license, registration and insurance are required. There are ORV speed, direction, trailer towing, passenger, and drug and alcohol rules in effect.